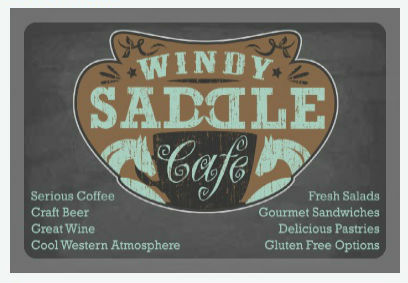 The Windy Saddle Cafe is the perfect place for your next office party, private gathering or fundraiser. Our space is open after 6pm for your next event. We offer a full espresso bar, cocktail/wine/beer bar, and full food menu from appetizers to complete dinners or just dessert. Our staff is professional and our food and beverages are exceptional. Please connect with us to discuss ideas, options and dates. Three-week notice is preferred to reserve Windy Saddle Cafe. Do you only want catering? Don’t need the space, just the homemade goodness from Windy Saddle? Not to worry – we offer catering outside the Windy Saddle! One-week notice preferred. Whether it’s for a birthday, a special teacher an office meeting, family gathering or just because, our Windy Saddle bakers are happy to put together the perfect treat(s). Let your imagination go … cupcakes, cookies, seasonal breads, bars, pies, muffins, scones and so much more. We offer vegan and gluten free options too! Our gluten free flour is mixed in house and gets rave reviews. Want to have a cookie or cupcake decorating party at home for your little one? We can set you up with all you need: undecorated baked goods, frosting and sprinkles. Or how about frozen cookies to bake off at home whenever it sounds good. Again, let your imagination run wild and let us make your life a little easier. Brown Bag Lunch … want to grab lunch for that road trip to the mountains or for that walk along the creek? Give us a call and order up! Sandwich, chips, cookie, beverage … and you’re on your way. Please contact us to see if we can make it happen or call DeAnn directly at 303-279-1905 with your heart’s desire. Click here to see pictures of some of our baked goods.